Rod Piazza and the Mighty Flyers play Brixton Sunday night. That damned harmonica kept following him around. Rod Piazza was eleven years old. It was 1958, and his big brother took him to a club to see the legendary bluesman Jimmy Reed. The brothers ended up backstage, and Piazza’s brother introduced the little boy to Reed. “This young man is trying to play guitar,” his brother told the bluesman. Reed looked at the young Piazza and somehow saw that the boy needed something more than a guitar. “He looks like he needs something to go with it,” Reed said. He handed the boy one of his old harmonicas. Piazza kept the harp and messed around with it from time to time, but he still focused his energies on guitar. Then, when Piazza was a teenager, the Rolling Stones happened, and all of a sudden everyone was looking back into those old blues sources. A blues scene popped up around Piazza’s hometown, Riverside, but most of the kids were hellbent on starting up rock and roll bands. Piazza was still messing around on guitar when he and his buddies were sleeping on a beach one night and someone started playing harmonica. It caught Piazza’s attention, and he took the harp and tried to play a few things. His friend promptly gave him the harmonica. A few months later, he got a call to join a band, but when he showed up for rehearsals, he discovered they already had a guitar player who was better than he was. The harmonica finally got him, and it would soon blow Piazza into a different world. He formed his own band, the Dirty Blues Band, in the mid-1960s, cut a couple records and generally was considered a young-up-and-comer. But then one night he went to the famed LA venue the Ash Grove to see a man named George “Harmonica” Smith play. Smith never won much renown among the general public, but among musicians he was widely considered the best harmonica player this side of the Little Walter, the revolutionary harp player who reinvented the instrument in part by amplifying it. Piazza was feeling pretty cocky. He sat at a table right in front of the stage, and before the show, when Smith was setting up, Piazza boldly asked the bluesman if he could play some harp. “Yeah,” Smith said, without even looking up. Then the show started, and Smith came out blowing hot. Piazza had never heard anything sound quite like it, and he immediately regretted his bluster. Sure enough, halfway through the set, Smith leaned down handed the harmonica to Piazza. The kid hesitated. He was scared witless. Piazza blew. And he nailed it. Smith was visibly shocked, and his longtime guitar player – Pee Wee Creighton – broke into a huge smile. He asked Piazza his name. “Rod! You are outta sight!” Pee Wee said, loudly, on stage. But “Harmonica” Smith wasn’t done with Piazza, not by a long shot. “Let’s see what he can do with Big Mama,” Smith said, and he pulled out a chromatic harmonica and again told Piazza to get on the stage. The chromatic harmonica is a different beast. It’s bigger and more complicated, using a button-activated slide bar that redirects air. Chromatic harps are used in classical and jazz and by the only the very best players – such as Little Walter and George “Harmonica” Smith. Piazza couldn’t say no, but he could barely play the thing. He flailed around a bit, and Smith was satisfied. He asked the crowd to give the young man a round of applause and ushered him back to his seat. School was out. Piazza thought that was the end of his “Harmonica” Smith experience. But a few months later, he had his own gig at the Ash Grove, opening up for Howlin’ Wolf. He had his eyes closed during a solo when he heard the crowd erupt, and he opened his eyes to find Smith on the stage, staring at him balefully. It was his turn to do the upstaging, which he promptly did, but the two also played together so well that backstage Howlin’ Wolf got mightily pissed off – the two harp players were an opening act that was a tough thing to follow. After the show, Smith told Piazza they should start a band. Piazza didn’t really believe him, but sure enough he got a call a few months later, and thus was born Bacon Fat, the band he and Smith formed. Piazza was all of 18 years old. Smith took him to the “black clubs” where few white kids dared to tread. This was when giants still walked the Earth, and suddenly Piazza was in their midst. He and Smith would play together only a few years, and Piazza may not have realized it at the time, but a torch was being handed to him. And so Piazza learned. Smith and his entire generation are almost all gone, but their sound, their legacy, is very much alive. Piazza is now one of the blues elders, and through him and a handful of other players, Little Walter and “Harmonica” Smith are on stage every night. Piazza and his wife, Honey, are among the current standard bearers of the blues. Honey is a boogie-woogie piano player, and their band, the Mighty Flyers, is one of the tightest, most swinging units in any genre of music. 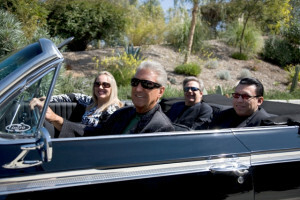 Between Rod and Honey, the band has been nominated for more of the prestigious W.C. Handy Awards – the Oscars of the blues – than any other act in history. Their sound encompasses a broad swath of blues territory – Honey’s striding piano runs bring to mind blues legend Otis Spann, while Piazza’s powerhouse sound takes what he learned from the old harp masters and injects it with a modern edge. “I think what I’ve tried to do was take what I could play of Little Walter and what I learned from George and then what I felt and take it somewhere from there,” Piazza said. Piazza said his sound was shaped in part by playing with those damned loud guitar players. The result is a big sound that leads a band the way few harmonicas ever have. Fellow blues harp player Mark Hummel has noted that harmonica playing has been underestimated for four decades. Once upon a time, during the Age of Little Walter, it was a respected instrument. But then Bob Dylan came along and used the harmonica in his haphazard way – more as a sound effect than an instrument – and suddenly every guitar strummer was blowing on a harp. The fate of genuine harmonica players has been in decline ever since. Among those still blowing, Piazza is an acknowledged master, someone who has stylistically taken the instrument places it has never gone before. Rod Piazza and the Mighty Flyers play Brixton Feb. 28. $10. See brixtonsouthbay.com or themightyflyers.com for more info.